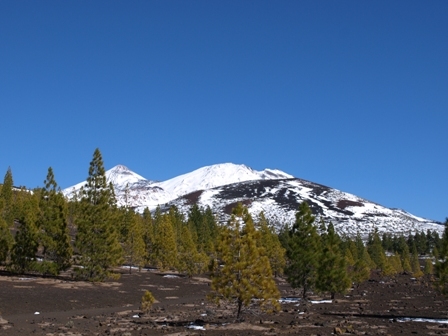 Mount Teide has received its first snowfall of the winter as temperatures, at that high altitude, fell below zero. The white volcano summit was a spectaculat sight. However the 2 roads leading up to the mountain, via La Orotava and La Esperanza, had to be closed on Thursday due to the treacherous icy conditions and reduced visibility with sleet. 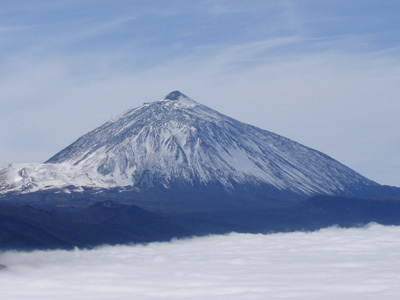 The Teide volcanic peak on the island of Tenerife acted as a mock-up of the Moon landscape last week, with eight European student teams tuning, testing and driving their lunar rovers in preparation for a robotics competition that took place during the dark nights of last weekend. Roving on the Moon is not easy. Lunar robotic explorers have to travel in a vacuum, over rough and steep terrain covered by crust and dust. The Sun heats the rovers up to 110*C and, when driving into a shadow, the temperature can drop to -100*C, or almost -200*C in the polar regions. The rovers have to be remote-controlled or able to steer themselves autonomously, making manoeuvres and scientific research very difficult. 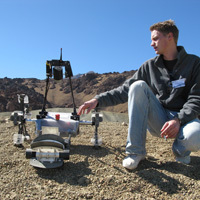 ESA’s Lunar Robotics Challenge for university students makes roving a little bit easier, as the conditions on Teide at an altitude of 2000 metres are much more comfortable for the drivers and rovers alike. The terrain is still difficult – comparable to that found at the lunar poles – and operating the robotic vehicle in the dark, freezing cold of night with only the aid of radio links, cameras and sensors is challenging.